Gaining muscle and weight can be difficult, especially for those with poor appetite or a fast metabolism. If you are one of these “hard gainers”, what you need is a supersized dose of calories, with the correct balance of protein, carbohydrates and fats. Start your bulking phase... go for ultimate mass-building support with Firm Foods Mass Gainer! 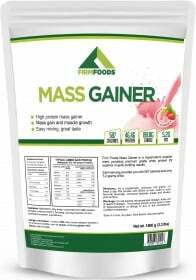 The Firm Foods Mass Gainer is all about helping you pack weight and muscle mass in the shortest possible time. Each serving is loaded with 600 calories, 46g of Whey protein and 90 grams of carbohydrates (mostly Maltodextrin) in the perfect 2:1 ratio of 2 grams of carbohydrates per each gram of protein. This is a high-protein gainer ensuring that most of your gains come from muscle instead of fat. The protein in Firm Foods Mass Gainer provides you with a complete line-up of amino acids needed for supporting muscle growth and development. The carbohydrates will serve as a source of energy for your physical activity. With Firm Foods Mass Gainer, you don't need to keep on calculating how many more calories you need to force yourself to eat. All you need is a delicious shake to take care of your high calorie needs for building muscle! Move up weight classes in no time... by taking Firm Foods Mass Gainer! Mix with 500 ml water and shake vigorously for 30 seconds. Consume 1 serving one to 3 times daily. For optimal use, take between meals, 30-45 minutes before workouts, and/or immediately after workouts. WARNINGS Mass Gainer : Do not exceed recommendations for suggested use. Keep out of reach of children. The product should not be used in case of hypersensitivity or allergy to any of the ingredients of the formulation. Food supplements should not be used as a substitute for a varied and balanced diet and healthy lifestyle. Store in a cool, dry place. Please Recycle. BEST BEFORE: Please see lot number and expiration date stamped on the packaging.